Legend has it that during the era of Roman transcendence in Europe, a regional lord by the name of Druon Antigon intercepted all ships plying the sixty miles of the Schelde estuary from the North Sea to the inland port of Antwerp. If the sailors refused or could not meet his demands for tribute, he cut off their right hands. Whether true or not, the legend illustrates a fact that for centuries has influenced the use and growth of one of Europe's greatest ports. Whoever controls the banks of the Schelde estuary controls Antwerp. Plagued by Dutch jealousies that found expression in forts built along the Schelde, Antwerp did not begin until 1863 the modern growth that by the eve of World War II had transformed it into a metropolis of some 273,000 inhabitants. The decision paid dividends with capture of the city, its wharves and docks intact, by British armor on 4 September. (See Map 2.) Yet then it became apparent that the Germans intended to hold both banks of the Schelde along the sixty-mile course to the sea, to usurp the role of Druon Antigon. Antwerp was a jewel that could not be worn for want of a setting. Leaving Antwerp behind, the Second Army thus had embarked on a second part of its assigned mission, to "breach the sector of the Siegfried Line covering the Ruhr and then seize the Ruhr. "5 The task of clearing the banks of the Schelde eventually would fall to Lt. Gen. Henry D. G. Crerar's First Canadian Army, which was advancing along the Second Army's left flank under orders to clear the Channel ports. tical picture somewhat, none other than Le Havre could approach the tonnage potentiality of Antwerp. Le Havre itself was too far behind the front by the time of capture to affect the supply situation appreciably. Even with possession of the Channel ports, the importance of Antwerp to Allied plans could not be minimized. While fighting to open the Channel ports, the Canadians had neither the strength nor supplies to do much about Antwerp. On 13 September one Canadian division had sought a bridgehead over two parallel canals northeast of Bruges (the Leopold Canal and the Canal de la Dérivation de la Lys) that marked the line which the Germans intended to hold on the Schelde's south bank, but German reaction was so violent and Canadian losses so heavy that the bridgehead had to be withdrawn the next day. On the same day that Field Marshal Montgomery issued this directive, General Eisenhower received a report from the Royal Navy that stirred him to action. The report apparently climaxed an apprehension that had been growing in the Supreme Commander's mind for several days, a concern that the 21 Army Group could not open the Schelde estuary while at the same time pursuing its other objectives. Unless supplied immediately with adequate ammunition stocks, the report of the Royal Navy indicated, the First Canadian Army would be unable to move to open Antwerp until November. great need for opening of the Schelde estuary, and he was willing, "as always," to give additional US troops and supplies to make that possible. On the West Schelde's north bank, Generalleutnant Wilhelm Daser's 70th Infantry Division had an infantry combat strength of nearly 7,500, plus some 300 engineers. These were organized into three regiments, two on the island and one on South Beveland, the latter after the 245th Division was shifted eastward against the MARKET-GARDEN salient. Two other German divisions were to figure prominently in the fighting about Antwerp. These were the 346th and 711th Infantry Divisions of General Sponheimer's LXVII Corps on the mainland north of Antwerp. Of the two, the 346th (Generalleutnant Erich Diestel)49 was the stronger with an infantry combat strength of somewhat better than 2,400 men, augmented by an artillery force of thirty-eight 105-mm. howitzers. The 711th Division (Generalleutnant Josef Reichert) was considerably weaker, a "static" division which had been badly mauled during July and August. In mid-September, the 711th had only three battalions of German infantry and another composed primarily of Armenians and remnants of an Ost battalion. The division had but nine artillery pieces of various calibers. Less prominent roles would be played by the 719th Infantry Division on the LXVII Corps left wing and by contingents of the LXXXVIII Corps, the latter after the left wing of the Second British Army got into the fight. stalemate settling over the MARKET-GARDEN salient permitted the Germans to send reinforcements. At Woensdrecht they committed both Colonel von der Heydte's 6th Parachute Regiment and a part of Kampfgruppe Chill.51 Not until 16 October, two weeks after the start of the attack, did Woensdrecht fall. In the meantime, on 6 October, the 2d Canadian Corps opened the drive on the Breskens Pocket with the 3d Canadian Division, moving behind massed flame throwers, forcing two crossings of the Leopold Canal. Here General Eberding's 64th Division lay in wait. For three days the situation in the Canadian bridgeheads was perilous. 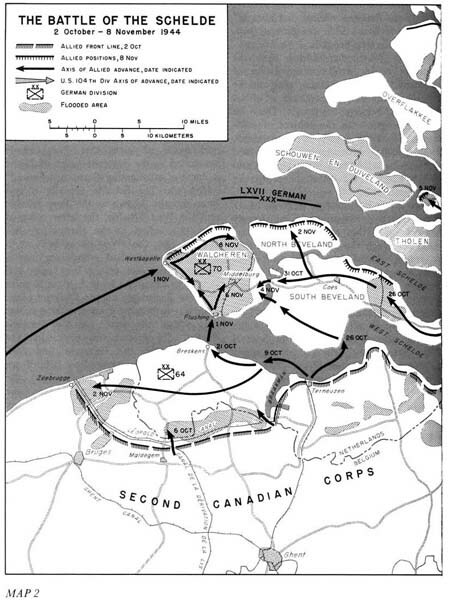 On 9 October contingents of the 3d Canadian Division staged an amphibious end run from Terneuzen, but not until 14 October, after a few tanks got across the canal, did substantial progress begin. By mid-October, after nearly a fortnight's fighting, about half the Breskens Pocket remained in German hands. This was the situation when on 16 October Field Marshal Montgomery accorded unqualified support to the battle of the Schelde. The net effect was that the 12 Corps of the Second British Army took over the eastern part of the Canadian line to launch a drive from the MARKET-GARDEN salient near s' Hertogenbosch to sweep the south bank of the Maas River. Their line thus shortened, the Canadians were to push their right wing forward to the Maas in that part of the zone remaining to them between Woensdrecht and the British. The bitter fight to eliminate the Breskens Pocket continued. On 21 October Breskens finally fell. By the end of the month the Canadians had pushed General Eberding's remaining troops into a water-logged pocket near Zeebrugge and on 2 November captured the German general. All resistance in the Breskens Pocket ended the next day. After almost a month of the most costly kind of fighting, the south bank of the West Schelde was clear. Making labored but steady progress, the Second Army's drive resulted in capture of two main objectives, 's Hertogenbosch and Tilburg, two and six days, respectively, after the offensive opened. By the end of October Second Army patrols linked south of the Maas with the right flank of the First Canadian Army's 1st British Corps. By 5 November the Second Army had cleared its entire zone. Unfortunately, inclement weather during much of this period had enabled thousands of Germans to escape almost unhindered to the north bank of the Maas. and mid-October when this corps alone had faced the giant task of clearing the entire region between South Beveland and the MARKET-GARDEN corridor. Before the end of September General Crocker's troops had pushed north to occupy Turnhout and had established a sizable bridgehead beyond the Antwerp-Turnhout Canal. By the time the Second Army took over part of the zone and attacked on 22 October, the 1st British Corps had pushed north to the Dutch-Belgian border. As the Second Army joined the offensive, General Crocker's corps consisted of one British infantry division and two armored divisions, one Polish, one Canadian. On 23 October, the day after the big drive commenced, the corps assumed even more of an international complexion as the 104th U.S. Infantry Division began moving into the line to help in the drive northward to the Maas. Men of the Timberwolf Division assumed responsibility for a sector near the Dutch-Belgian frontier astride a main highway leading northeast from Antwerp to Breda, some twenty miles south of the Maas River and six miles southwest of a German strongpoint in the village of Zundert. Here, at the town of Wuestwezel, the troops scarcely had time to erase their awe of combat or to become familiar with their surroundings-flat, pine-studded, water-soaked terrain-before General Crocker ordered that they join the corps offensive northward. The initial division objective was Zundert. On a lower level the 104th Division, in assuming positions along the Antwerp-Breda highway, had occupied a line virtually astride the boundary between the enemy's 346th and 711th Divisions. The first of the delaying positions the 104th Division expected to encounter was southwest of Zundert almost exactly along the Dutch-Belgian border, a position manned by an estimated seven understrength infantry battalions. Advancing due north with three regiments abreast, General Allen's Timberwolves received their baptism of fire on 25 October. By nightfall they had pushed back stubborn German patrols and outposts almost to the frontier. Continuing to advance in the darkness, the men made the first in a long procession of night attacks that were eventually to give the 104th Division something of a name in that department. The second day they forced the main delaying groups southwest of Zundert to withdraw and by daylight on 27 October were set to assault the village. whether it was coming in or going out. They knew what it meant to kill men and to have their own killed. If a machine gun went "br-r-r-r-r-p," it was German; if it went "put-put-put," it was one of their own. The green division was fast becoming experienced. The next day, 28 October, the 104th Division occupied Rijsbergen, about halfway from Zundert to Breda. That night the 415th Infantry (Col. John H. Cochran) launched the second night attack in the division's short combat history to break another delaying position covering the Roosendaal-Breda highway that ran diagonally across the division's front about seven miles north of Zundert. General Allen now was prepared to direct his troops either on Breda or to the north and northwest against the Mark River. Even as Colonel Cochran's 415th Infantry was reaching the Roosendaal-Breda road, General Allen was receiving his orders. Along with the three other divisions of the corps, which had been advancing generally northward on either flank of the Americans, the 104th Division was to be reoriented to the northwest to force crossings of the Mark. Responsibility for Breda was to fall to the 1st Polish Armored Division on the 104th Division's right. 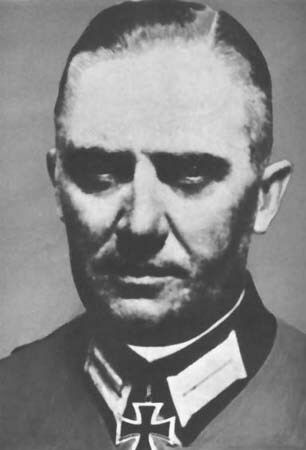 By 30 October, sixth day of the offensive, General Allen had concentrated his division along the Roosendaal-Breda highway. As the day opened, Colonel Cochran's 415th Infantry spearheaded a drive toward the Mark River in quest of a crossing near the village of Standdaarbuiten. The 44th Infantry (Col. Anthony J. Touart) subsequently was to cross and pursue the attack to seize Klundert, almost within sight of the south bank of the Maas. As the 415th Infantry neared a bridge over the Mark at Standdaarbuiten, any doubt that this was to be the enemy's main position rapidly dissolved. Machine gun, mortar, and artillery fire showered across from the north bank. Even so, a sneak attack by one battalion almost succeeded in seizing the bridge intact; only at the last moment did the Germans blow it. Neither the 49th British Infantry Division on the 104th's left flank nor the 1st Polish Armored Division on the right had yet reached the Mark. Perhaps counting on the surprise a quick thrust might achieve, the corps commander, General Crocker, told General Allen not to wait for the other divisions but to force a crossing of the river alone before daylight the next day. The 415th Infantry's 1st Battalion, commanded by Maj. Fred E. Needham, drew the assignment. Crossing northeast of Standdaarbuiten just before dawn on 31 October, men of the leading company clung to the sides of their assault boats to avoid grazing machine gun fire that swept the crossing site. Once on the north bank, they stormed across an open meadow to gain protection along a dike from which they might cover the crossing of subsequent waves. By 0900 the entire battalion had made it and pushed more than a thousand yards beyond the river. But here the Germans forced a halt. The men could advance no farther, and German fire on the exposed crossing site denied reinforcement. Enemy shelling severely limited use of the battalion's 81-mm. mortars and frustrated all efforts to keep telephones working. A heavy mist not only precluded any use of air support but also restricted the effectiveness of counterbattery artillery fires. 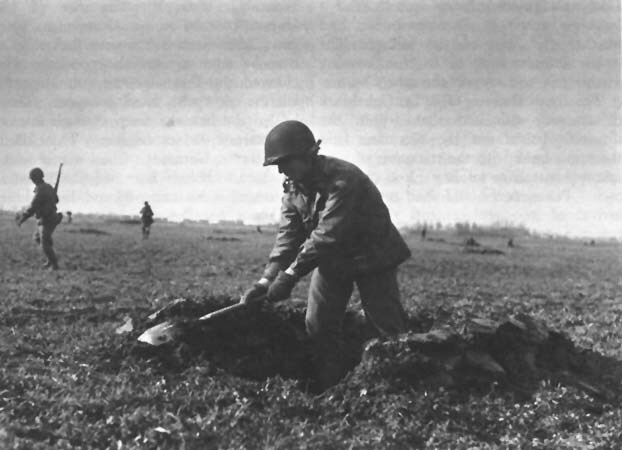 MEN OF THE 104TH DIVISION dig foxholes near Standdaarbuiten. Major Needham's men nevertheless successfully held their tiny bridgehead until late afternoon when the Germans stormed the position with infantry supported by six tanks. Firing into individual foxholes, the tanks soon encircled the position. As night came General Crocker gave approval to withdraw what was left of the battalion. A patrol led by Lt. William C. Tufts managed to cross the river and break through to the battalion to facilitate withdrawal of most of the men that were left. Two days later the division discovered that sixty-five officers and men, unable to withdraw, had hidden in buildings and foxholes, subsisted on raw beets and turnips, and withstood both American shelling and German patrols without the loss of a man. Cochran's 415th Infantry was to send a battalion across at Standdaarbuiten and another just east of the village. The 414th Infantry was to feign a crossing farther east and support the others by fire. The 104th Division G-2, Lt. Col. Mark S. Plaisted, estimated that within the division's boundaries the Germans held the north bank with the remnants of nine infantry battalions totaling 1,200 to 1,300 men. Prisoners, he said, had told of the arrival of 200 replacements three days before and of German commanders who threatened their troops with force to fight to the last. For an hour preceding the nighttime assault, guns all along the corps front ripped into the German line north of the river. Sprinkling their volleys liberally with lethal timed bursts, artillerymen of the 104th Division concentrated much of their fire on Standdaarbuiten, believed to be a German strongpoint. In the left of the division sector, a battalion of the 413th Infantry commanded by Lt. Col. Collins Perry made the assault. Although the men were subjected to small arms fire even as they scrambled into their assault boats, they stuck to their task. Reaching the far shore, they found that only a few yards farther they faced a canal almost as wide as the Mark. Without hesitation, the men plunged into the chill water and waded across. Wet to their armpits and plagued in the darkness by persistent mortar and small arms fire, they nevertheless pushed steadily forward. The rest of the regiment followed and set about jamming a left hook around to the north of Standdaarbuiten. A driving force in the advance of Colonel Perry's battalion was a weapons platoon leader, 1st Lt. Cecil H. Bolton. Wounded while directing fire of his 60-mm. mortars on two German machine guns, Lieutenant Bolton nevertheless led a bazooka team against the positions. He charged the first machine gun alone to kill the crew with hand grenades. Then he led the bazooka team through intense fire toward the second gun. They killed the three Germans who manned it. Lieutenant Bolton later led the bazooka team against an enemy 88 and directed fire to knock out the gun. He subsequently received the Medal of Honor. In the meantime, the battalion crossing at Standdaarbuiten found that the artillery preparation had taken an awesome toll of the village and the enemy positions. The men quickly swept through. A few hundred yards farther east, another battalion successfully hurdled- the river, despite machine gun and rifle fire at the crossing site, and soon linked its bridgehead to the others. Shortly after midnight the Germans counterattacked with infantry supported by four tanks, but the men of the 415th Infantry were too well established. They dispatched the Germans with small arms fire and timely artillery support. By 0115, 3 November, only slightly more than four hours after the infantry had begun to cross the Mark, 104th Division engineers had constructed a treadway bridge near Standdaarbuiten. As they began work on a Bailey bridge, disturbingly accurate German shellfire began to fall. Before daylight enemy shelling knocked out a section of the treadway bridge. Convinced that the Germans had an observer in the vicinity, the engineers after dawn conducted a thorough search. They found a German officer and a sergeant hidden beneath the abutment of the old bridge directing fire by radio. On 4 November the First U.S. Army directed that, as soon as released by the First Canadian Army, the 104th Division was to move to the vicinity of Aachen. The next day, when General Crocker assigned the division an additional mission of assisting the Polish armor to take Moerdijk, General Allen decided to give the task to his division reserve, the 44th Infantry, while withdrawing the rest of the division to prepare for the move to Aachen. On 6 November this move began. Colonel Touart's 44th Infantry maintained pressure on the holdout position at Moerdijk until late on 7 November when relieved by a British regiment. The Poles and the British cleared the last Germans from the south bank of the Maas the next day, 8 November. The campaign in the southwestern part of the Netherlands had cost the 104th Division in its first action almost 1,400 casualties.60 The division made no estimate of enemy losses but recorded the capture of 658 prisoners. Though the fighting had been basically unspectacular, it had achieved the valuable end of establishing a firm and economical northern flank for the 21 Army Group along the south bank of the Maas. 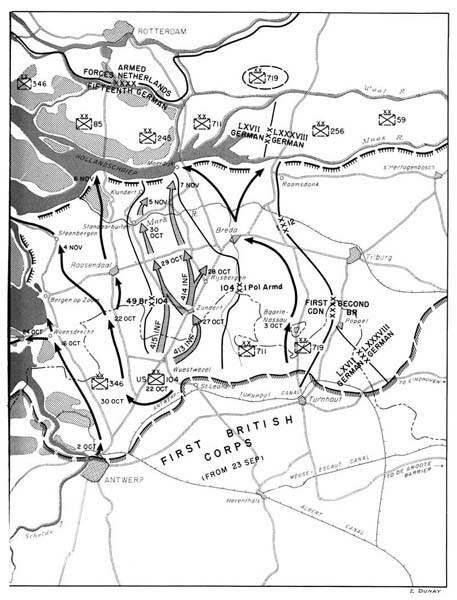 By 24 October, only a day after the 104th Division first had moved into the line, earlier advances of General Crocker's 1st British Corps already had helped to provide a firm base near Woensdrecht for operations westward against South Beveland, while progress along the south bank of the West Schelde had removed any danger of German guns in the Breskens Pocket intervening in a fight on South Beveland. That same day the Canadians opened a drive to clear the estuary's north bank. batteries on Walcheren Island," the 70th Division commander, General Daser, withdrew the survivors from South Beveland for a last-ditch defense of Walcheren.61 By the end of October, South Beveland was in Allied hands. Walcheren became only a question of hard fighting and time. On the eastern side of the island, the Canadians at last had forced a bridgehead across the constricted causeway, but they could not expand it. British units took over with little more success until on the night of 2 November they moved in assault boats south of the causeway to gain another foothold on the island. Two days later troops in the two bridgeheads linked and started westward. In the meantime, the British at Flushing and at Westkapelle had joined forces on 3 November. A systematic advance to clear all Germans from the island ensued. On 6 November the town of Middelburg fell and General Daser surrendered. On 8 November, eight days after the first attack, the British reported all organized resistance on Walcheren at an end. Meanwhile, on 2 November, North Beveland also had fallen. The battle to clear the approaches to Antwerp was over. Only casualty figures could adequately bespeak the bitterness of a fight waged under appalling conditions of cold, rain, mud, and flood. Between 1 October and 8 November, the First Canadian Army—including Canadian, British, Polish, Czechoslovakian, French, and American troops—had incurred nearly 13,000 casualties. More than 6,000 of these were Canadians. The Germans had lost in prisoners alone more than 40,000 men. Even as the commandos and infantry rooted the last resistance from Walcheren Island, mine sweeping began on the Schelde estuary. Some three weeks later, on 28 November, almost three months (eighty-five days) after British armor had seized Antwerp's wharves and docks intact, the first convoy of Allied ships dropped anchor in the port. Antwerp at long last was capable of producing for the Allied cause. while another 2,500 exploded in the environs. Casualties were high. Some 2,900 Antwerp civilians were killed and another 5,433 seriously injured. Losses among Allied military personnel were 734 killed and 1,078 seriously wounded, a total of 1,812. The most disastrous single incident resulting from V-weapon attacks either in Antwerp or elsewhere on the Continent occurred in Antwerp on 16 December when a V-2 hit the Rex Cinema during a crowded matinee. In one blow, 296 soldiers were killed and 194 seriously injured. In terms other than casualties, damage to military facilities in Antwerp and the port was slight, though civilian property loss was enormous. Major military losses were 2 or more warehouses, temporary damage to 1 lock, and slight damage to 20 berths. Perhaps the greatest advantage accruing to the Germans from the bombardment was a drain upon Allied manpower, ordnance, and equipment occasioned by intricate and heavily manned antiaircraft defenses employed about the City.67 Although military authorities were concerned at times about unrest among dock workers and about civilian morale in general, the citizens of Antwerp rallied to the challenge much as did the people of London. In the end, Allied use of Antwerp as a port never was seriously impaired by the bombardment. At times the port handled an average of 25,000 tons of supplies per day. The third primary target of the V-weapons was the Belgian industrial city of Liège. As the First U.S. Army turned Liège into a major supply center, the Germans as early as 14 September sited their bombs and rockets against the city. During the course of the war, Liège was hit about 1,086 times, while another thousand projectiles exploded nearby. Civilian casualties totaled 1,158, while 92 soldiers were killed and 336 wounded. The only major damage to military installations was the loss of a hospital and some 250,000 gallons of gasoline. As at Antwerp, the V-weapons, for all the terror of them, proved highly inaccurate and never interfered seriously with military operations at Liège.